The internet is a terrible place. Sure, it’s led to countless advances, enabled markets that never would have existed otherwise, and allows us humans to keep in touch with each other in ways never seen before, but it also pushes me to make stupid decisions with my money on a regular basis. For example: if there were no internet, there’d be no 555Gear. If there were no 555Gear, I wouldn’t have stumbled across this video of the Seiko Alpinist. If I didn’t stumble across that video, I wouldn’t be typing this right now with a Seiko Alpinist on my wrist. Without the internet – or more specifically, the online watch community – it’s likely that the Alpinist would be relegated to obscurity outside of Japan. That’s not an indictment of the watch, mind. It’s just that the Alpinist doesn’t really have much name recognition to draw on prior to 1995. Versions older than that bear no resemblance to the modern SARB017, which was released in 2006 and has grown to be a hit among watch enthusiasts. The Alpinist is a small watch by modern standards. At 38mm wide by 12mm tall, it’s an altogether different experience compared to my usual go-to, the Seiko Turtle. If the Turtle is the largest watch I can wear, the Alpinist is probably the smallest. The 38mm case doesn’t look undersized on my 7.25” wrist, but anyone with larger wrists should definitely try it on prior to purchase. Thankfully the case isn’t tall enough to attract the attention of nearby door knobs. Ticking away inside the Alpinist is Seiko’s 6R15 movement, which is frequently found in middle and upper tier Seiko watches. Introduced in 2006, the 6R15 is a derivative of the venerable 7S26, though it adds hacking, handwinding, and a 50 hour power reserve. The product literature states that it shouldn’t gain more than 25 or lose more than 15 seconds per day, and my dalliance with a time tracking app indicates that the Alpinist is losing an average of 5.3 seconds a day – pretty good rate, all told. Resetting it once or twice a month has kept me on time, and doing so isn’t a hassle thanks to the hacking seconds hand. Additionally, the Alpinist’s movement features Seiko’s Diashock system, which allows the movement to better absorb impacts or falls. The case is stunning, if simple. Most of the surfaces have such a high polish that light runs across it like liquid. Yes, it will scratch easily: mine has picked up several already, despite all efforts to the contrary. They’re small enough that some polishing cloth could likely remove them, but for now they don’t detract from the aesthetics. As this is designed to be a mountaineering watch, it’s no surprise that the Alpinist doesn’t feature a display caseback, but instead has an engraved steel plate. The Alpinist has a signed crown at 3 o’clock and a smaller, unsigned crown at 4 o’clock. The former is the primary crown, and is used to wind the watch and set the time and date, while the latter is used to rotate the internal compass bezel (which will be discussed below). Both crowns are expertly finished and feature large ridges instead of knurling or a similar pattern, although the ‘valleys’ between ridges on the primary crown are machined for a bit of extra grip. It’s a subtle touch, but appreciated. Of course, the true draw of the Alpinist is the sunburst green dial. It possesses an odd (and difficult to photograph) characteristic: the color and texture of the dial changes depending on the light. In shade, it’s darker, smoother, and softer, almost like mossy undergrowth; direct sunlight, on the other hand, brings out warm undertones and sharpens the slight texture on the dial. The golden hands, numerals, and indices work surprisingly well in both cases. Seiko’s choice of cathedral hands lends an elegance to the design, even if I can’t shake the feeling that they’d look perfectly at home in Middle Earth. Given the dressy aesthetic of the dial and hands, one would expect some of the technical notes to detract from the cohesiveness of the design. Oddly enough, that isn’t the case. The interior of the hands are painted with Seiko’s Lumibrite, and there are lume pips on the dial just over (or under, depending on your perspective) each numeral and indice. They’re unobtrusive during the day, but sadly they’re also quite small, which means the luminance fades quickly, especially on the pips. The hands retain their glow – albeit faintly – for an hour or two. As mentioned above, the Alpinist does have an internal rotating compass bezel, which can be used to approximate your bearing. It only works in the Northern Hemisphere, and you need to know the position of the sun to use it, but I suppose it’s a handy backup. I’d never forego a real compass because of this. Luckily, it works fine as a timer. It’s not as easy to use as the dive bezel on my Turtle, but I can still use it to time rest periods at the gym or flush cycles on the job. Regrettably, it wasn’t implemented all that well: when changing the bearing, it will, on occasion, derail from whatever track it’s on and shift a bit. It’s not a dealbreaker, but it is an annoyance. If the Alpinist has a true Achilles heel, it’s the included strap. There is not a single positive thing to be said about it. The faux-alligator leather looks and feels plastic; it’s not even suitable for formal wear, which is what such a strap -should- be ideal for. What’s more, it’s not simply ugly: it’s uncomfortable to boot. The padding in the strap prevented the Alpinist from sitting comfortably on my wrist, and it never broke in to a noticeable extent. Luckily, there are plenty of good aftermarket straps available for the 20mm lug width. I alternate between a Worn and Wound Model 2 and a ToxicNATOS Shiznit in jungle green, and those suit my needs well. The stainless steel OEM bracelet is spoken well of online, though I can’t personally vouch for it. Ignore my grousing in the introduction. Yes, the purchase may have been ill-advised, but it’s certainly not one I regret. The Alpinist is a beautiful watch that I wear all the time. It’s flaws – the awful strap and the wiggly compass bezel – are easy to fix and ignore, respectively. There’s not much in the way of competition for the Alpinist, as there aren’t any other watches that fill the same niche. There are other field watches, other dress watches, other casual watches, but none of them have the look or feel of the Alpinist. That’s not to say that other watches aren’t as beautiful, accurate, or well made as the Alpinist – far from it – but that the Alpinist is unique enough that finding competitors is difficult. 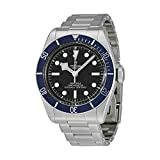 Those unique characteristics are also why I can freely recommend this watch to anyone that’s interested in it. It can be dressed up or down depending on your needs, and there’s honestly nothing else quite like it out there. Next up: the Rike Thor4s. 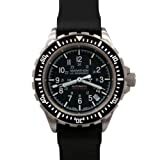 Editor: I recommend purchasing the Seiko Alpinist at Amazon. Please consider that buying anything through any of the links on this website helps support BladeReviews.com, and keeps the site going. As always, any and all support is greatly appreciated. Thank you very much. Nomos Glashutte is a watch brand based in Germany that has made a name for themselves by creating stylized watches that range from casual to dress to even highly complicated. They are known for utilizing their own in-house movements with beautiful finishing visible through sapphire case backs. German made watches have a lot of history in the large horological landscape. With brands like Sinn, Damasko, Glashutte Originale, and even A Lange Sohn. Nomos, however, is a relatively new kid on the block. Founded in 1990 they started out specializing in making hand wound watches that drew a lot of elements from the Bauhausian school of design (see our review on the Junghans Max Bill). In 2005 Nomos debuted an in-house movement that they have continued to develop and expand on. They now have over ten in-house designed movement calibers as well as their own escapement design that is slowly being integrated into their watches. I was originally drawn to Nomos while I was searching for something that would compliment the rest of my collection but not overlap any area specifically. I wanted something that would easily dress up or down, and would potentially be a good conversation piece if the occasion arose. One of the things that drew me to the Nomos Club originally was the case thickness. A 10mm thick automatic watch? Sign me up. Nomos also offers the club in a couple different case sizes, with 40mm being the second largest. The challenge in choosing a case size really comes down to the lug to lug measurement. My 40mm has a 51mm lug to lug measurement, those are some long lugs. On my 7.25” wrist it barely fits, any larger and it would overhang my wrist. If you have a sub-7” wrist I highly encourage you to look at the 38 or 36mm versions of the club. The movement in a Nomos is really something to behold. Well decorated, well regulated, and a unique in-house caliber. In this way it really becomes a watch person’s watch as well as a exercise in near-haute-horology. Nomos offers display backs on most of their watch models, the in-house nature of what they do basically requires it. In these watches it IS about the movements. Practically speaking, the watch keeps excellent time. I haven’t noticed any amount of deviation. My time-graphing app is telling me +/- 8s/day, but take that with a grain of salt. The cases Nomos use serve to highlight the work they put into their dials and movements. For a simplistic design that in many ways adhere to a very Bauhausian design language it would make sense for the simple steel case to not distract from the basic legibility. The entire case is polished steel with a bezel-less design that leads up to the crystal. The polish does lend itself to a refined “classy-ness” in the overall appearance of the watch. I am guessing that the Club would look considerably more casual if it was brushed. To boil the case and crown down, I think it’s safe to say that with both of these elements Nomos really wanted to draw attention away from them, and rather focus on the dial, or if it’s off the wrist, they wanted the movement to stand out through the display back. They have made considerable investment to ensure that they have something unique to offer in these areas, and instead of watering that down with an overly “designed” case they kept it simple. Firstly, the case-back is a sapphire display back show a beautiful Nomos Epsilon movement that is decorated and signed. This really showcases what is, in my opinion, the biggest attraction to the Nomos brand. Secondly, is the water resistance. Nomos rates the clubs at 10 ATM, it should be more than adequate for swimming, hand washing, being drunkenly pushed in a pool, etc… It does not have a screw down crown, but this isn’t something you’d take on a canoe trip anyway. I just like having the peace of mind knowing that if one of my stupid friends throw me in a lake, I’ll only be buying a new phone. Working top down on this category is pretty easy. The crystal is a flat sapphire crystal that sits just above the simple polished bezel. They both do exactly what they are supposed to, perfectly, and nothing else. Just like with the case, I’d say that the bezel and crystal serve to get you to the dial. The dial is a slightly off white color, with painted numerals every other hour, and a plain indice between. The dial is signed just below the noon indice a there is sub-seconds dial at 6 o’clock. The dial is accented by small orange details, first and most apparent in the hands, but then also around the outer minute ring which counts up from “05” in small orange script. I think this is a pretty nice use of color, and “grounds” the orange hands. The hands themselves are painted with some sort of black lacquer giving them a really cool glossy appearance, the contrast between the black and orange also pop the hands off the dial making it very legible. It’s important to point out that this dial is non-luminous. It does not glow in the dark at all, Nomos DOES make a version that has lume, but most of their watches are non-luminous. This, to me, really emphasizes the style of watch that Nomos makes. These are not tool watches. Most Nomos’ come on leather straps, but not just any leather strap, they come on OEM Shell Cordovan leather straps. Shell is a really impressive kind of horse leather that will last for a long, long time. It maintains a nice shine, and doesn’t crease or “pull-up.” These straps are great, but they are long. I have a larger then average wrist size, and I wear this on the last hole. Generally speaking, I wear a larger strap, so this is pretty unusual and worth knowing on the front end. Man, how do I sum up the Nomos Club? What I was looking for when I bought mine, was something that would fit the slot of my “fourth watch,” without overlapping anything else. I already had a diver, chrono, and a vintage piece… I wanted something that could be a little dressier, but also had the potential to be casual. Something you’d wear to a jazz night at a winery. Nomos’ watches fit this exceedingly well. The nice thing that Nomos has also done to make the Club a more versatile piece is by giving it some water resistance. If what you want is a fancy piece, with some legit horological chops, but also has some uniqueness, I don’t think you can go wrong with a Nomos Club. I recommend purchasing Nomos Watches at Amazon or JomaShop.com. Please consider that purchasing anything through any of the links on this website helps support BladeReviews.com, and keeps the site going. As always, any and all support is greatly appreciated. Thank you very much. Seiko is easily one of my favorite watch companies in business currently. They are one of the few manufacturers that holds the illustrious distinction of being entirely in-house. Everything from growing their own quartz crystals to making their own o-rings. That’s a distinction that is worth noting. The Samurai is a big watch. It wears big, feels big, and looks big. This isn’t necessarily a bad thing however. I have a 7.25” wrist and it fits me really nicely, I think this is largely due (as always) to the case height. The case itself is wide, with a wide bracelet lug, but it doesn’t stick up from your wrist like other large watches do when you wear them. The lugs descend from the case in such a way to “hug” your wrist, honestly the first word that pops into my head when I look at it, is “pancaking,” it allows the whole watch (especially when worn on the bracelet) to wrap around your wrist instead of sit on top. It’s a little abstract to try and explain but it amounts to the watch wearing very well in spite of it’s actual case size. I think the case of the Samurai is the biggest thing that sets it apart from other Prospex diver offerings. The lugs are very angular, almost pyramid-y descending down abruptly from case. All the surfaces of the watch are brushed apart from some minor polished details on the non-crown side. The crown is also another feature on the Samurai that sets it apart from other Seikos, it’s large, knurled, and sits at 3 o’clock. Most prospex divers have their crowns at 4, and only have serrations on the crowns instead of the actual knurling. The SRPB009 runs on the Seiko 4R35 movement, which essentially is the same movement that the new turtle reissues are using with the exception that that day complications is redacted. Ideally I would have liked the Sumo movement (6R15) with it’s longer power reserve and slightly more proven track record, but honestly mine is running around +5s a day, that’s pretty hard to complain about in a ~$500 watch. Okay, the bezel on this watch is complete fire. It’s dark blue with a light blue accent from noon to the 15min counter. The edges are knurled offering great grip at the noon and six o’clock position allowing you to turn it easily. You are sort of limited to only gripping it in those two positions, there isn’t clearance around the sides of the watch to actually turn the bezel. The dial is a sunburst blue with applied markers for the hours. There are small yellow accents on the quarter hours chapter ring, these match up with the yellow tip of the seconds hand. The hands are lumed with the same proprietary LumiBrite compound that Seiko uses. It’s incredible… if you left this watch on your nightstand it could keep you awake at night. Lastly the date window sits at 3 o’clock, the date wheel is white with black text on it. Conceptually I’d think this would clash with the overall aesthetic of the watch, but it blends in nicely. Overall I think it’s important to take a second and comment on how the the dial and bezel of the Blue Lagoon are the elements that make it THE Blue Lagoon. There are several other color combinations available in the new Samurai, including a Pepsi and all black, so if for some (weird) reason the blue doesn’t match your curtains you could opt for a different version. Okay, and the crystal… I feel like this is where Seikos catch a lot of heat. They used a flat hardlex crystal. I have scratched Hardlex in the passed (dunno how), but this one sits down below the bezel and is relatively protected. You’d really have to try to damage it. Seiko isn’t known for their quality bracelets. The Samurai bracelet however is pretty decent. It has some cool polished accents on the center links without having the entire center link polished. There’s a nice diving extension to the clasp if you require it. The biggest criticism I think I could give it, is just that overall it’s sorta, “jangly,” there is a definite rattle to it when you wear it, but apart from that I don’t mind it. The end-links are really cool on this particular one, they fit tight to the case, and really accent the angular features of the Samurai itself. I’ve owned a bunch of Prospex Seikos. I’ve had two MM300’s, couple Tunas, Sumo, Turtles, etc. The Samurai is a really cool piece in contrast to Seiko’s other offerings. I think the casework, and dial choices are just different enough to set them apart from the rest of the Prospex line without making them seem detached entirely. The Blue Lagoon specifically is a striking piece on the wrist, with great lume, a proven and dependable movement, at a price point that should fit most people’s budget if they’re looking for a nice “sub-$1k” watch. 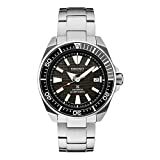 I recommend purchasing the Seiko Samurai at Amazon. Please consider that purchasing anything through any of the links on this website helps support BladeReviews.com, and keeps the site going. As always, any and all support is greatly appreciated. Thank you very much.